The BeagleBone Breadboard is designed to provide a simple but productive prototyping space. 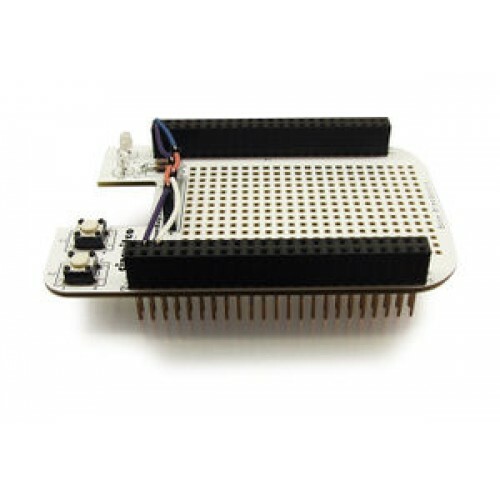 This prototyping cape is equipped with a patterned prototyping area, two general-purpose LED’s, two tactile switches, one 8-pin female header and two stackable 46-pin connectors. LED’s and switches are mapped to an 8-pin header for convenient access. With each purchase including an adhesive solderless breadboard and jumper wire kit (140 pieces in 14 different lengths), the BeagleBone Breadboard offers users a powerful prototyping tool without the needs of soldering. Breadboard 1x Solderless 170 tie point 1.8" x 1.37"
Jumper Wire Kit 140x 14 lengths .1" .2" .3" .4" .5" .6" .7" .8" .9" 1" 2" 3" 4" 5"
The solder prototyping area on the BeagleBone Breadboard is patterned into rows and columns of connections. At the center of the cape are multiple 3-connection rows separated by 14-connection columns. The far right end of the cape features a series of 2-connection rows. Users can utilized these rows for extra connectors. The adhesive solderless breadboard features 34 five-connection rows split equally into two sides. The bottom of this breadboard can be peeled and attached onto the solder prototyping area of the BeagleBone Breadboard. In addition to two 46-pin connectors and an 8-pin header, the solderless breadboard provides a complete solderless solution for prototyping BeagleBone.